Another workers’ representative of Haft Tapeh Sugar Factory, Mohammad Heydari Mehr was arrested by security forces on November 7, 2007 after being asked to refer to intelligence and security offices in the city of Shoush. Ghorban Alipour, another representative of Haft Tapeh Sugar Factory workers was arrested at his residence and taken away by security forces on November 5, 2007. Latest arrests in the company led to a morning shift strike, as it was warned earlier. 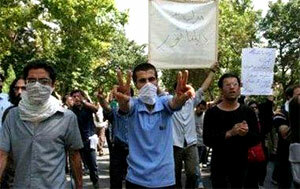 The workers of Haft Tapeh Sugar Factory threatened more strikes should their representatives not be released soon. Also, the Committee for Defending Mahmoud Salehi reports that Ghorban Alipour and Mohammad Heydari Mehr, two detained Haft Tapeh Sugar Factory workers’ representatives were released by securing 10 million tomans ($10,000) bail on November 15, 2007 and November 14, 2007. Mohammad Heydari Mehr was arrested by security forces on November 7, 2007 after being asked to refer to intelligence and security offices in the city of Shoush. Ghorban Alipour, another representative of Haft Tapeh Sugar Factory workers was arrested at his residence and taken away by security forces on November 5, 2007. Accusations against Ghorban Alipour and Mohammad Heydari Mehr include acting against national security and talking to foreign media.